Create an attractive CD that makes people want to make a purchase with printed CD front cover inserts. These custom CD inserts print in full color on both sides with a finished size of 4.75" x 4.75". You can choose the number of panels you want for your insert, starting with a single panel that provides a front cover and reverse side. You can add up to three additional panels to create a 2, 4, 6 or 8 page insert. We also offer multiple fold options for 3 page inserts, including Tri-Fold, Z-fold, and Gate Fold. For 4 page inserts, you can choose from popular fold types such as French Fold, Parallel Map Fold, Double Parallel Map Fold, and Accordion Fold. We print CD inserts in full color on quality 100lb. or 80 lb. gloss paper. Each printed sheet is folded by us, and shipped to you ready to insert. 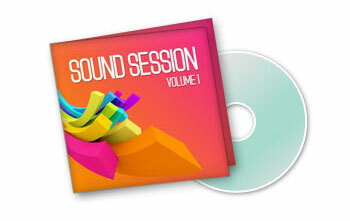 You can download design templates for CD front cover inserts that can be used in Photoshop, Illustrator, and InDesign. These templates include the correct file size, bleed, trim marks, and color profiles, making it simple for you to design your own insert. CD inserts have a finished size of 4.75" x 4.75"
The price of this product includes scoring and folding. Use the front cover as a selling vehicle by creating a design that allows potential buyers to quickly identify what you’re selling. Consider this scenario: you’ve just given a performance to a crowded venue. As the audience leaves the building, they pass by a table where your CD sits, available for sale. What will those people see on the cover? Is your name or the name of your musical group prominent? Is there a photo on the front that will help them connect your CD with the performance they just heard? While the front cover is crucial to sales, consider what other kinds of information you might want to put on additional panels. These “extras” – such as credits, lyrics or photos – may be valuable to you, or they may be desired by listeners and fans. Make sure you give yourself room to communicate everything you want related to your artistic endeavor. CD Front Cover is rated 5.0 out of 5 by 18. Rated 5 out of 5 by RealLoveMusic from Beautiful Inserts This is our 2nd insert order with Next Day Flyers and we are so please again! We love the quality of the product and the rapidness of shipping available. We are definitely repeat customers! Rated 5 out of 5 by Cadams1407 from Best company I was very satisfied with mt cd covers they are perfect!!!! Rated 5 out of 5 by makemehotp from Perfect cuts on CD inserts. I love using NDF. They offer a great value for inserts. The most important thing I like about their product is that their inserts and tray cards are cut perfectly and evenly on each one. This is critical to the work that I do. Shipping (and drop shipping) is fast too! I’d highly recommend this service other others.